We’ve said it before. We meant it then. We mean it now. It’s a rare feat that one of the very architects of a genre somehow manage to be better than nearly every musician or band that’s followed them in that style. Yes, Kraftwerk is in a class all their own. With the noted exceptions of Daft Punk or Boards of Canada, there is scarcely any electronic music act to follow Kraftwerk that has more solidly mastered what the genre could be. Here, at our favorite home away from home The Hollywood Bowl, Kraftwerk delivered another sterling example of why they are masters of all things in the vertex of electronic and dance, this time with the largest display of their Kraftwerk 3-D set imaginable. For this particular evening there was only one opening act. L.A.’s own Lyris Quartet had the undesirable challenge of opening for a titan of the electro music being neither electronic or dance, making use of only string instruments in a string quartet approach. The quartet played some beautiful arrangements, but sadly, the crowd on hand appeared to largely not be paying attention. Only some songs earned applause and most of the audience could audibly be heard speaking over the music. Following a short intermission the lights went down and the crowd cheered as a robotic vocoder voice began singing the repetitious refrain “Eins zwei drei vier funf sechs sieben acht” from their classic song “Numbers.” Yes, little more than counting in German becomes an enveloping greeting into another world at the hands of the four-piece band. The group is revealed standing before the gigantic video wall accompanied only by their trademark keyboard stands/podiums. “Numbers” is mutated into an immaculately arranged sequence of tracks from their album Computer World. Transitioning from there into “Computer World” and subsequently also “Home Computer,” “Home Computer” and “Computer Love,” the crowd cheered for each new set of 3-D graphics where numbers and various visuals of archaic computers flew by. This opening sequenced was followed by another such sequence of related tracks. This one led off by the supremely minimal “The Man-Machine,” a vocoder-laden song where the intonation of the words “man” and “machine” in different keys is essentially the whole song (along with an equally simplistic synth melody), yet somehow incredibly works. The sequence continues with the outer space inspired “Spacelab” featuring visuals of a satellite traveling above earth. Then “The Model,” a song surprisingly, almost, kind of a romantic longing for an unobtainable model is played before this sequence is completed by “Neon Lights” and “Metropolis.” The latter two songs were one of the set’s few moments that came off as less than brilliant, as they lacked some of the memorable punch everything else in the set brimmed over with. The legendary “Autobahn” came next, allowed to stand alone with charming 3-D animation of a VW Beetle traversing the historic German motorway. 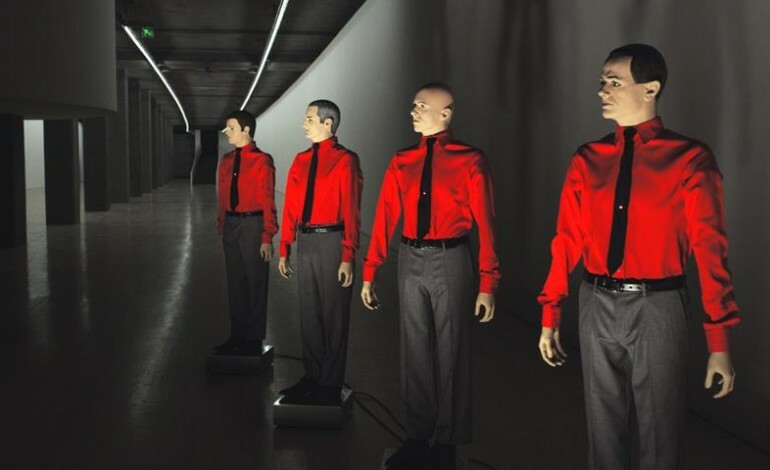 The playful, bounding synthesizer melody of the song is enough alone to inspire joy, but Kraftwerk takes it a step further and renders the song as an epic interpolation of its simple motifs. For those wondering, the band’s four members Ralf Hutter, Friz Hilpert, Henning Schmitz and Falk Grieffenhagen stand by their keyboard podiums playing instruments never visible. It can be assumed they are each triggering the sounds on display through a varied approach of elaborate sequencers, but for any cynics out there, yes, it’s entirely possible the band might not be playing anything at all. Unlikely given their pedigree and the pristine nature of the music, but like Daft Punk’s famous 2006 performances, it’s really hard to know for certain. One thing is for sure, what few vocals the songs utilize are rendered by Hutter and he is indeed singing live. Some of the best material of the set followed from here. First, an updated version of the cautionary “Radioactivity.” The band traditionally plays the semi-updated version from the 1991 album The Mix, featuring the names of cities where infamous nuclear power plants existed: Chernobyl, Harrisburg, Sellafield and Hiroshima. However, this night’s performance featured Hiroshima replaced by Fukushima, the site of the world’s most recent nuclear disaster and a massive cross-section of the lyrics sung in Japanese before returning to the song’s chorus “Stop radio activity / it’s in the air for you and me.” This may have been the band’s astounding minimalism at its absolute best as the confection came together as a stunning transformation, as if visiting a far-off alien world. The group went even further for their next cuts, playing both the traditional version from 1983 of “Tour de France” and the nearly fifteen-minute redux of the song from the 2003 release Tour de France Soundtracks. It’s hard to imagine a song about a famous mountainside bicycle race sounding like an epic action movie smackdown, but there it is. That’s exactly where Kraftwerk manages to go with it. Before heading to the set’s final movements, the inspiring “Trans Europe Express” is performed, another transportation-themed song, this time wonderfully constructed evoking the various sonic pitter patter of a cross-country train ride. Only… doing that and coming across like three interlocking, unforgettable melodies that could be the ultimate score to the best spy movie never made. Following a well-deserved standing ovation from the crowd, the group leaves the stage in darkness. When the lights come back on, the group’s signature mannequin-like robots are present behind the podiums and “The Robots” is played. Now, it’s possible the band is playing the music off stage, but beyond the animatronic robots moving slowly to the music no one is on stage for this at all. Nevertheless, the audience cheers wildly for the song’s infectious rhythm and the robots’ slow dancing. In the U.S.A., it’s hard to imagine crowds universally cheering for something like this thirty years ago. The final sequence of the night features the neatly interlocking three-song sequence from the 1986 album Electric Café: “Boing Boom Tschak,” “Techno Pop” and “Musique Non-Stop.” Each are different variations on the same theme, alternating melodies around the words “boing boom tschak,” “music nonstop” and “techno pop.” It may not sound like much, but it becomes the logical conclusion to a set of unparalleled brilliance, taking these iterations and juxtaposing them every way imaginable without seeming monotonous and yet somehow danceable and peppy. Each member has a chance for a triggered “solo” of sorts before walking off one-at-a-time to an ovation from the audience. Forty-seven years since their inception, Kraftwerk are still the smartest kid on the block. Nobody does it better, at least not in electronic music.